THANK YOU FOR YOUR ENTRIES, THIS COMPETITION IS NOW CLOSED! 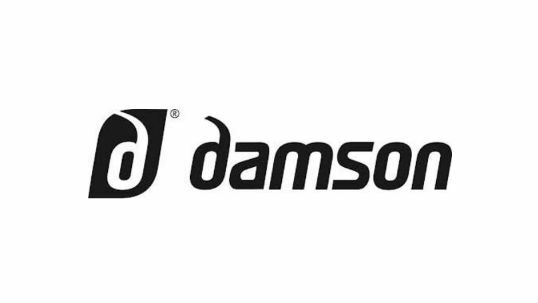 We’re happy to announce a competition in partnership with Damson Audio, a Yorkshire-based tech company offering a range of exciting and innovative audio and visual gear. We’re interested in HeadBones in particular because their technology means they’re suitable to wear while cycling without impacting your ability to hear what’s going on around you. What’s the Prize and how do I enter? There are five prizes on offer. All five winners will receive a pair of tickets to the Cycle Show in Birmingham, and the overall winner will win a pair of tickets and a pair of Damson HeadBones. The winners will be chosen on 15th September 2016. Please leave your email address with the comment so we can contact you if you win! This will not display publicly. HeadBones aren’t headphones. They use bone conduction technology to deliver the music to your brain in a completely different way. The bone conduction element of the design features that two pads which rest just in front of your ears, and vibrate directly onto your head . Your skull’s natural acoustic properties mean that the sound is transferred directly to your inner ear. You can hear the music in high fidelity, and also hear what’s going on around you with perfect clarity. What is the Cycle Show? The Cycle Show is one of the biggest events in the cycling calendar, hosted in the NEC Birmingham between 23-25 September 2016. The 15th anniversary of the event, and it looks to be a good one. Last year’s event was the biggest-ever, and featured a record-breaking number of bike companies; this year there will be even more. They will be exhibiting the forefront of cycling design and technology. Medal winners and cycling stars are set to make an appearance, too: Martyn Ashton, Ed Clancy, Callum Skinner, Joanna Rowsell-Shand, and Chris Boardman will be there, among others. Sky’s quest for marginal gains has gone a bit too far. It’ll save you 4 watts they said! Completing a Ride 25 leg on a Brompton quicker than his fellow riders wasn’t demoralising enough for Guy. He’s now hard at work testing a new weapon for his ongoing twisted psycolocogical experiment. Bit big for the kids race ain’t he? Teams are struggling with the technical requirements for the next Paris-Roubaix…. Chris Froome realised that washing his bike in really hot water was probably a mistake when he got on and realised it had shrunk a little. Does my bum look big on this ? The Tour was a bit wet this year !! Thinks “Why oh why did I not get a full size saddle”. The latest UCI technical equipment guidelines appear to have had some typo’s in the dimension specifications section. Never too late or low. Hmmm, either this bike’s shrunk or I’ve had way too many coffee and cake stops! Geoffrey quickly regretted entering the local sportiff in the under 12’s category to avoid paying the entry fee. Aero is everything but these tri-bars are too far back. Marginal gains just got serious! I’m going a fitting bike tomorrow,I think the seat need adjusting ? Just a tiny bit more speed. The next triathlon I must swim faster, this was all that was left in transition! i told you to look at the washing instructions didnt i,, now look! Maybe I should cut back on protein shakes for a bit! Following the UCI’s recent historic decision on relaxing their strict rules on Time Trial bike specifications, this radical design by VEB Sachsenring (makers of the iconic Trabant) was unveiled ahead of this year’s cycle show. New Felt bike shrinks in rainy weather, fans remain loyal to the last. Tour de France riders now required to carry their own spare bikes, Chris Froome reported to be happy as he hates running. Are you looking Chris Froom? This is how to go aero!!! 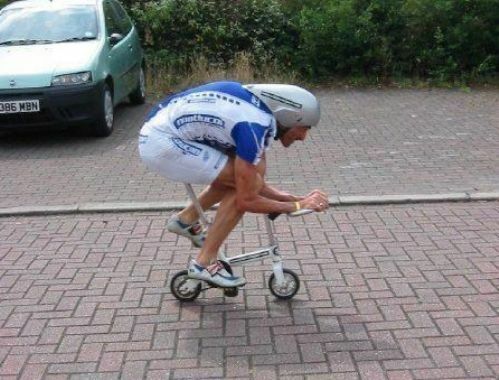 Dave was told he’d get a better aero position on a size 54 frame. Dave doesn’t understand the difference between centimetres and millimetres! I thought I told you NOT to jet-wash my bike! So glad the salesman advised the padded shorts. Tony Martin has gone really minimal with his new TT bike. They said free the mind and your legs will follow but I can’t free my mind when my knees are hitting my forehead!! Team umperlumpa’s new signing shows his commitment to sponsors bike. Inaugural giants pave timetrial gets off to a flyer! Its all about the engine! Well you looked like this to me Chris Froome….on The Tour de France! Wish I hadn’t put my bike in that 90C wash now!! Just got to keep ahead of the broomwagon up the Ventoux…….. Knew upsetting the DS was a BAD idea! Following recent changes to the EU health and safety directive on falls from heights……. Only another 1,320 days to John o’ Groats! Matches the prize money in most UK races. “Leave it to us” they said….. “well produce a design with a great aero advantage ” they said …. I’m how far off the back of the groupetto? So is THIS position low enough? Using the pressure washer was a BIG mistake!! Everyone keeps laughing… I bet it’s because I forgot my socks. Well you said you wanted a portable one!